Fire safety should be a priority in every home. Smoke and heat detectors linked to your monitored security system can offer you true peace of mind, by notifying our central station with a residential fire alarm systems. In addition to notifying the proper authorities, a monitored fire system may qualify you for a discount on your homeowners insurance. Hardwired electronic smoke detectors and battery operated detectors are not designed to be linked to your security system. These detectors are for life safety only, and are too sensitive to be used as monitored devices. 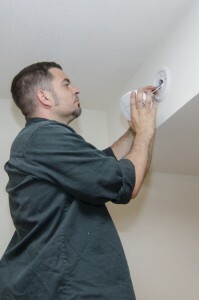 Security and fire system smoke detectors are more discriminating and are designed to eliminate many false fire alarms, while still providing reliable fire detection. GCSI is a member of the National Fire Protection Association.